PURPOSES In this fourth 51 second video of a 21-part series, Shawn Buckley explains Section 4 of the Charter of Health Freedom, “Purposes.” This very small and common section, explicitly states the reason why the Charter exists and how it is to be used. This helps the courts understand how this proposed law should be interpreted. The purpose of the Charter of Health Freedom is to protect and promote health freedom in Canada by endorsing access to natural health products and traditional healing practices. This section speaks to preserving access to any and all remedies an individual deems appropriate for treating their health condition. As the author of this standalone Act, Shawn Buckley makes clear the key features of each section. He breaks down the proposed legislation into language that everyone can understand. Next, we will look at Section 5, where Shawn will discuss the guiding Precedence in Law. 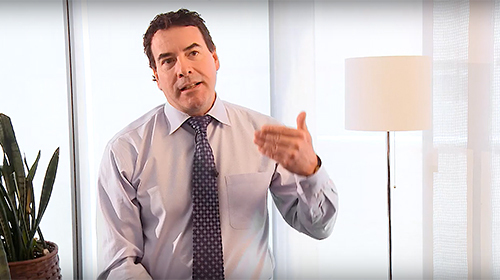 PRINCIPLES In this third 2:08 minute video of a 21-part series, Shawn Buckley explains Section 3 of the Charter of Health Freedom, “Recognition and Declaration of Principles.” This section identifies the principles that should be guiding any regulatory decisions regarding health freedom. Specifically, that the average person is competent enough to make their own health decisions, and that each individual is the best judge of whether or not a treatment is working for them. The Charter of Health Freedom makes it clear that all methods of treatment should remain available and accessible to Canadians. 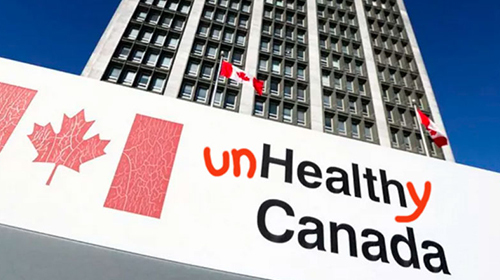 Health Canada insists that the average person is not to be trusted to make their own health decisions, and therefore requires federal intervention to generate approved treatment options. Regulation, as it stands, removes access to unapproved treatments, even if they are saving lives. As the author of this standalone Act, Shawn Buckley makes clear the key features of each section. He breaks down the proposed legislation into language that everyone can understand. 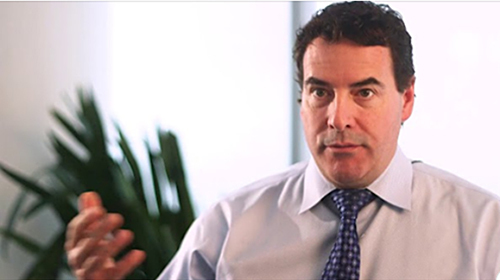 In the fourth clip, coming soon, Shawn will discuss the Purpose of the Charter. Fibonacci spiral memes are part of internet play. We could not resist producing our own! 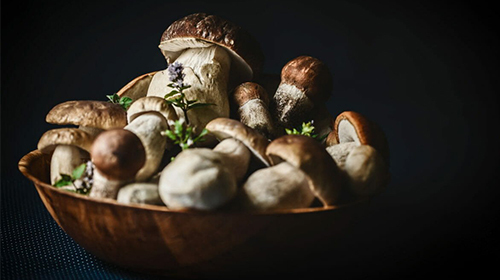 Nature’s popular display of the formula found in mathematics are in sunflowers, pine cones, branching trees, field daisy petals and the nautilus shell. The Victoria Health Show petitions, collected by volunteer Shannon Lee Rae at the end of January, finally arrived. They were in such perfect order we had to fan them out to make the most of the moment. We recounted for accuracy. She reported right. 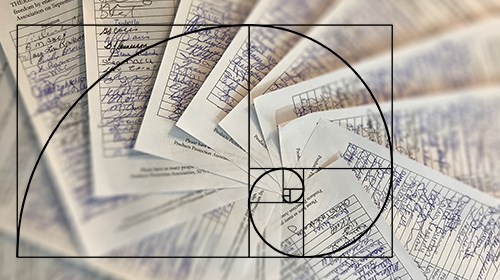 Although not quite a Fibonacci number, her collection of 272 new signatures built the petition’s strength. NHPPA’s gratitude to her, is of course, infinite. With each individual signature, the petition continues its growth and adds to itself more value, without “changing the shape” of our ultimate goal. Enacting the Charter of Health Freedom. We invite you to be part of the pattern! Petitions in English, French and Chinese! 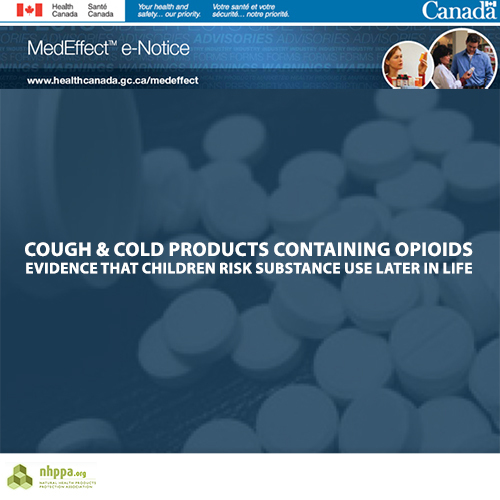 On February 18, 2019 Health Canada released a MedEffect Notice advising that children under the age of 18 should not be consuming cough and cold products containing opioids. The products in question contain codeine, hydrocodone, and normethadone. 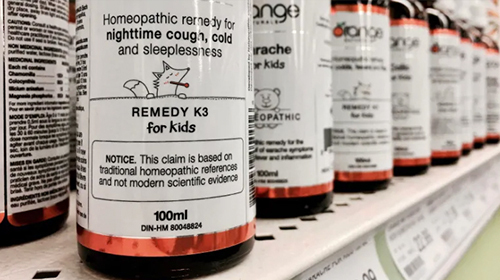 A safety review of these products has found that people who use opioids during childhood have an increased likelihood of problematic substance use later in life. 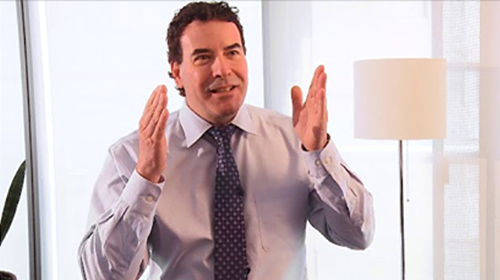 RIGHTS & FREEDOMS In this second 2:28 minute video of a 21-part series, Shawn Buckley explains Section 2 of the Charter of Health Freedom, “Recognition and Declaration of Health Rights and Freedoms”. This section identifies the fundamental freedoms that currently exist – and more importantly, should remain protected – under Canadian law. We cannot continue allowing our rights to be eroded. We have freedom of choice in health care. We have sovereignty over our own bodies. The rights to make personal health decisions are rights we have free from government interference. The Charter of Health Freedom takes the rights that Canadian courts and our common law tradition say that we already have, and codifies them so there will be no misunderstanding, by Health Canada or any other government department, that these are fundamental health rights that Canadians have. As the author of this standalone Act, Shawn Buckley makes clear the key features of each section. He breaks down the proposed legislation into language that everyone can understand. We are already anticipating the third clip where Shawn will discuss the guiding Principles in more detail. She signs off all of her emails with “Never Give Up”. And we don’t want to! Betsy V. recently encouraged the team with her email. She is one of our longtime supporters. For almost the entire time NHPPA has been working! She set up a regular monthly donation to spur the fight for health freedom. She’s a practitioner of many modalities and supports her clients with supplements that are now under threat. 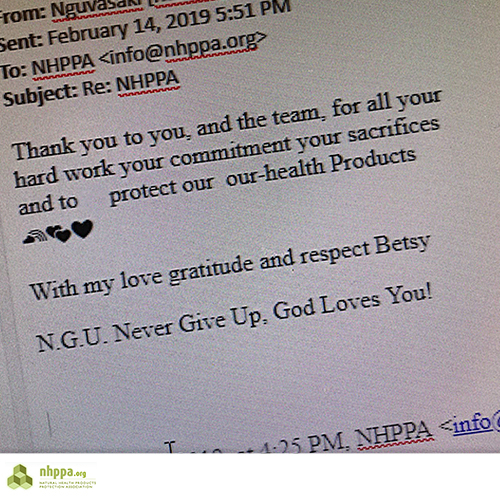 Because of Betsy’s commitment to give what she can, NHPPA’s small but efficient team is increasingly motivated to make a meaningful change in the natural health landscape. There are only words of gratitude right back to her! NHPPA relies on donations from stakeholders and the public. We have ramped up our work but are in significant need of financial support to continue for the rest of the year. We need 500 Canadians like Betsy who can commit a $25 monthly contribution. But no regular donation is too small! We need people who care about the future of the natural health industry and want to see us maintain the momentum. $25 a month for one year from 500 people would allow us make 2019 the strongest advocacy year ever. We need to take more action and enact more change at the federal level. We are unable to work for you, without you. Consider partnering with us and start your contributions today. 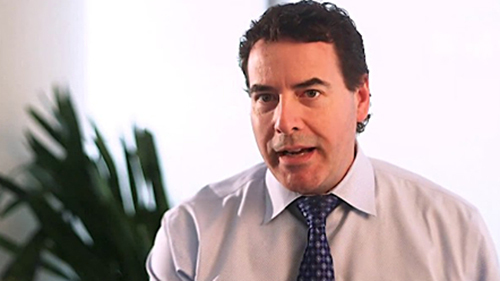 PREAMBLE In this first 50-second video of a 21-part series, Shawn Buckley explains the “Whereas” page of Charter of Health Freedom. It is an introductory statement that highlights the reasons we want to see the Charter enacted as law and sets the stage for why we need what follows. Your body is your body. You are competent enough to make your own educated health decisions. There is no space for government interference. The Charter of Health Freedom secures these truths and protects Canadians from Health Canada’s ever-growing level of oversight and control. The Charter protects your right to choose how to treat injury or illness in your own body. Unless we can move forward with a solution, the following generations will not appreciate what we lost – control over our own bodies. As the author of this standalone Act, Shawn Buckley makes clear the key features of each section. He breaks down the proposed legislation into language that everyone can understand. We are already anticipating next week’s clip where Shawn will discuss Rights and Freedoms.